Right in the path of one of 'Natural Wonder of the World' lie's the Mara Bush Camp offering you everything desired in an "authentic safari experience". The Great Migration....a yearly trek by almost two million Wildebeest from Tanzania's Serengeti plains to the world famous Masai Mara Ecosystem in Kenya. The Camp is a mobile camp and discreetly 'tucked away' in a riverine forest on the banks of the seasonal Olare Orok River. It is less than 1 km from Ol Kiombo airstrip and hence situated in the Masai Mara heartland. It is small & offers personalized services while providing all amenities to make you feel at home. Get spoilt after an exhilarating day out in the bush in your luxurious walk–in tent with a spacious verandah overlooking the Olare Orok & its numerous hippos. All 12 river front tents have been placed far enough apart to guarantee complete tranquility & privacy. These luxury tents are equipped with a comfortable 4 Poster bed (double / twin available on request) with a mosquito net, en-suite flushing toilet and sink unit in the bathroom with running water, hot bucket shower, clothes rack & storage chest, writing desk & verandah furniture, 1 liter of Mineral water daily to brush your teeth, towels & shampoo / conditioner & liquid wash soap. A fully equipped Mess Tent is situated close by, where all meals are served. 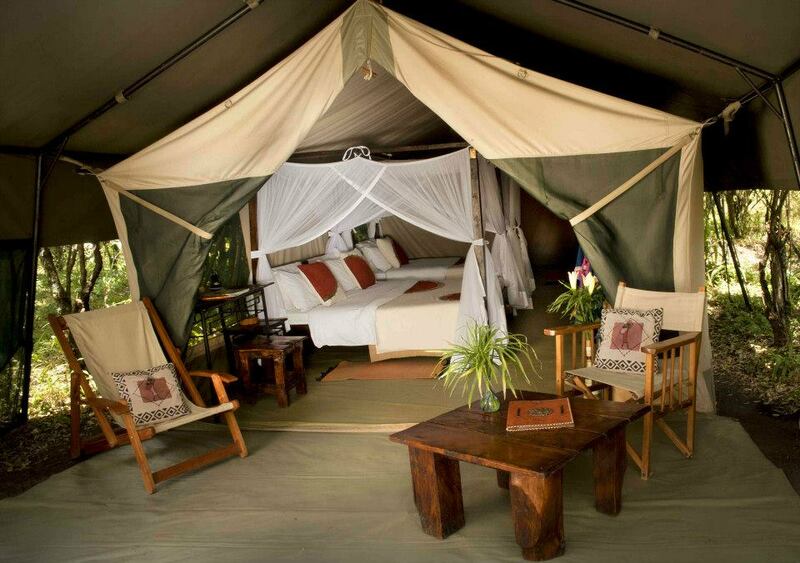 Adjoining is a luxurious and comfortable Lounge Tent, where one can meet up with other clients to exchange safari experiences and highlights of the day or catch up on reading a book from the in-house library. A Sundowner cocktail will help you unwind in front of a cozy campfire under the African stars with all its sounds of nature. All meals at the camp are freshly prepared by the camp's head chef, offering buffet lunches and set a’ la carte dinners. Our chef will also ensure that picnic meals are readily available for all those who prefer to stay out in the bush all day long. This is particularly interesting for photographers and keen game viewers. 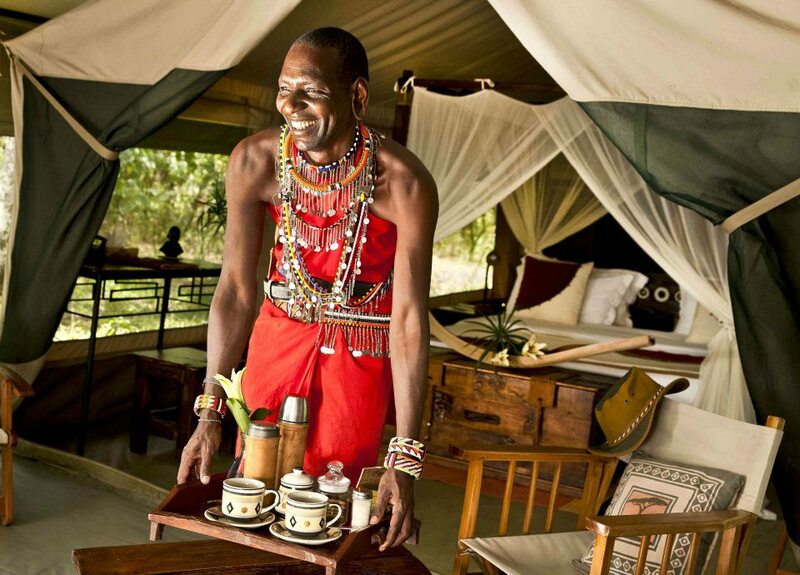 Early morning coffee / tea can be served on your private tent verandah. The camp is fully solar powered, but a Generator (well tucked away to ensure that there is no noise pollution) is available to provide power in order to charge all cameras & equipment. Mara Bush Camp is not fenced, therefore Maasai Morani's (warriors) will look out for your safety while you are sleeping. 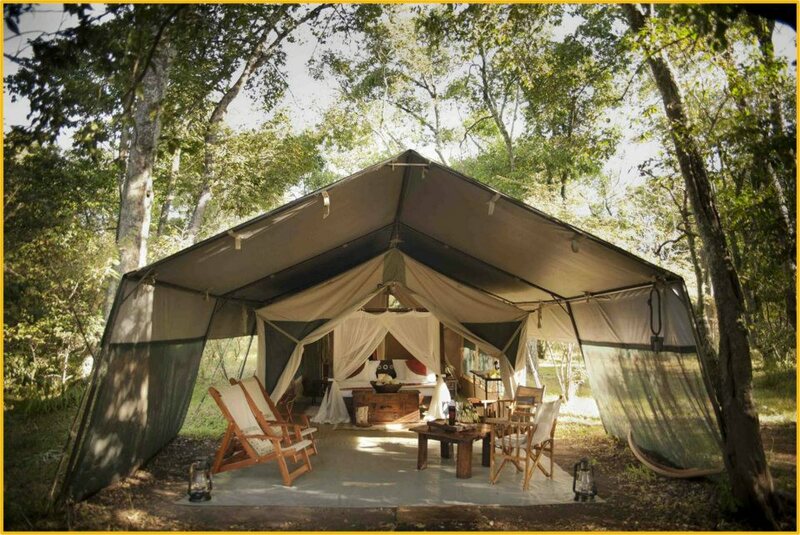 The camp is for the visitor who appreciates simplicity and privacy away from mass tourism and wants to enjoy an authentic 'safari' experience rather than a large, crowded lodge with swimming pool & entertainment. Are YOU dreaming of sleeping under canvas out in the bush as it was 100 years ago? If so, Mara Bush Camp is looking forward to welcoming you! 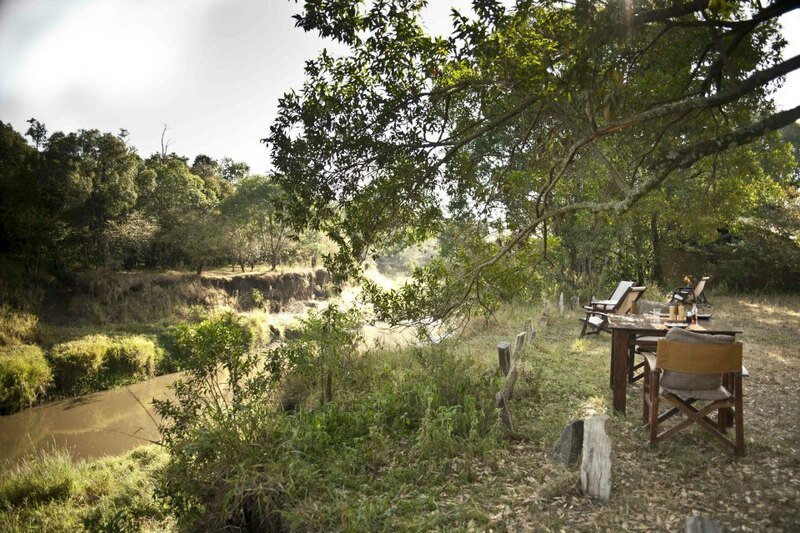 Are you interested in booking at the Mara Bush Camp? Click here for the best rates.